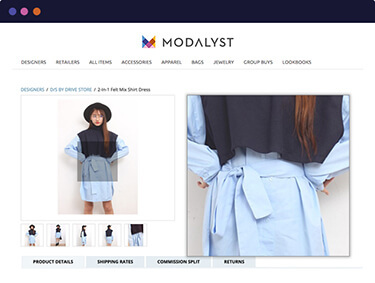 Brands, suppliers, and vendors use Modalyst to increase their distribution into specialty stores around the world. 90% of brands gain new ecommerce stockists every single week. 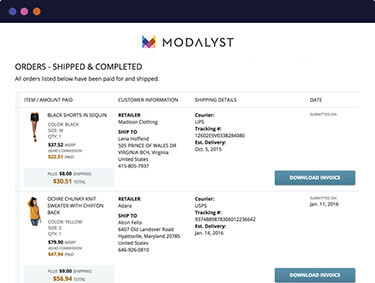 Modalyst automates dropshipping, making it easier than ever to work with thousands of ecommerce retailers without any extra legwork. Upload once, and ecommerce retailers easily add products to their storefront including images, descriptions, pricing, and inventory counts – all automated in real-time. Increase your brand awareness and exposure globally as ecommerce retailers easily add products to their storefront with one click. 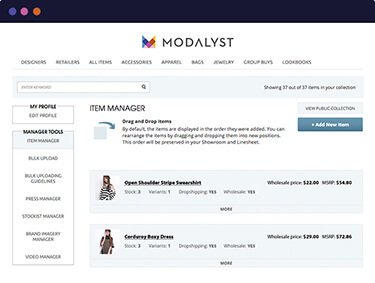 Modalyst automates the product data feeds, enabling retailers to start reselling your products in an instant. Bulk upload and list on-hand inventory in our open marketplace, where retailers discover new suppliers and add products to their storefront in one-click. Use our App to easily sync your collection to our marketplace and enjoy complete automation. Rich product pages and brand profiles bring collections to life with high zoom, items specs, and video. Our automated product feeds keep buyers updated automatically with product alerts, inventory level notifications, price changes, and tracking numbers. The retailer pays suppliers for products before it is sent to the end-consumer, including shipping fees. Brands are notified in real-time as orders are paid-for and ready to be shipped. Gain new stockists reselling your products every week. 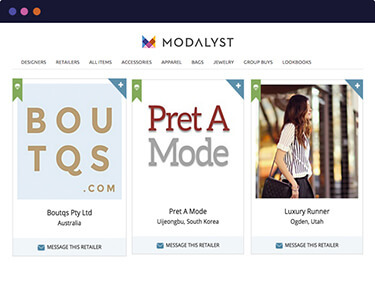 Modalyst gives suppliers instant access to a network of cool independent ecommerce retailers at the click of a button. Communicate directly with the retailer through our inbox. product data feeds, inventory updates across all reseller accounts, and order management. 100% of our brands gain new accounts each month. Enable retailers to start selling your products, while easily managing more accounts. Import 1,000s of items in an instant including imagery, descriptions, pricing, and inventory count. Retailers are automatically updated as any changes take place. Communicate directly with thousands of buyers globally – time-zone free. Create long-lasting retailer relationships, address special requests, and increase your business. No more payment processing problems. All brands are notified in real-time as orders are paid-for and ready to be shipped. Tracking numbers are communicated to the retailer in real-time too. More stores selling products = more marketing power. Each stores advertises brands to increase their sales. 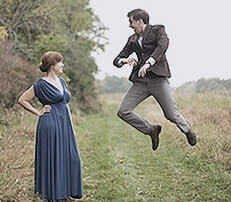 This, in turn, increases brand visibility and customer penetration. Analytics and insights on who has been looking at your products and profile, including clicks and impressions. View your dropshipping accounts on a per-item basis, or a per-retailer basis. The concept of a global and virtual tradeshow is long overdue, and Modalyst does this with an efficient and easy to use technological platform. It has given Hidesign an unparalleled, convenient and cost effective opportunity to introduce the brand to thousands of independent offline and online retailers. Modalyst is easy to use, and we highly recommend it! We have met a lot of new retailers on Modalyst, and thanks to that we have successfully expanded our market of retailers reselling our products. 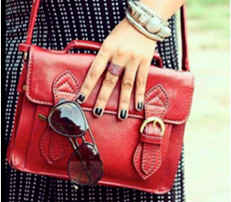 Hundreds of our products have been added to many online shops with Modalyst’s drop- shipping service. Our stock/production cycle is faster now as it generates more orders with Modalyst. With Modalyst’s Dropshipping platform, the number of retailers stocking Weekend Society online has exploded. We are now featured in more than 200 online shops which we met through Modalyst, and this has allowed so many more eyes on our brand. The succinct, simple way in which we can manage orders, inventory and digital assets for all of these sites' needs is a testament to the effective brand portal Modalyst has created.